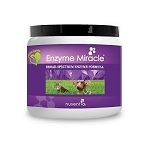 Animal Essentials Plant Enzymes and Probiotics improves digestion and the absorption of nutrients in dogs and cats. 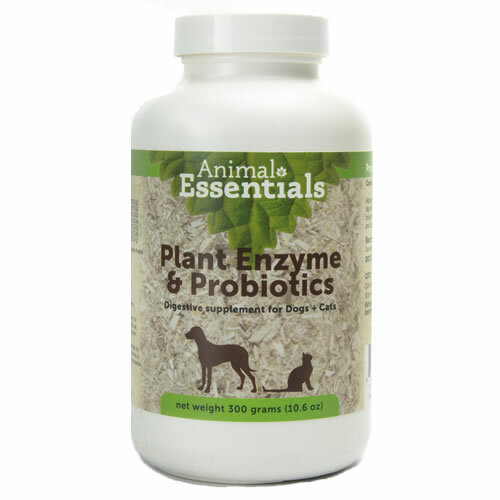 Animal Essentials Plant Enzymes and Probiotics - Improves Digestion and the Absorption of Nutrients in Dogs and Cats. This powder supplement from Animal Essentials is an easy way to provide enzymes to help break down food and unlock their nutritional value. The probiotic in this formula, Bacillus coagulans (also known at Lactobacillus sporogenes), survives stomach acid and moves into the intestinal tract where it can colonize and restore the proper balance between good and bad bacteria. Plant enzymes help replenish the enzymes that are destroyed during cooking and processing of food. Without enzymes, food can ferment and putrefy in the digestive system leading to chronic digestive problems, sluggishness and breath and body odor. Enzymes remove toxins and gas created during metabolic processes. 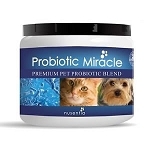 A properly functioning digestive system is vital to your pet's overall health. 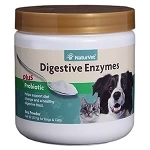 Animal Essentials Plant Enzymes and Probiotics for dogs and cats can help to restore balance of healthy bacteria and provide the catalyst for proper breakdown and digestion of food. Powder formula mixes well in wet or dry food. Each bottle contains 300 grams. Also available in 100 gram bottles. Both my dogs seem to feel better with the product. Amylase digests starchy foods to release simple sugars for energy. Protease provides protein digestion in the stomach and small intestine to build muscle. Lipase digests fatty acids allowing the pet to absorb Omega-3 fatty acids and Vitamins A, D, E and K.
Cellulase digests cellulose, reducing the bulking effects of fibrous foods. Hemicellulase is a mixture of enzymes which can hydrolyze the indigestible components of plant fibers. A probiotic that survives stomach acid and helps to restore healthy bacteria in the small intestines. Cats: Mix 1/4 teaspoon per cup of moistened food.